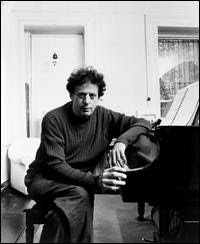 Like many, I discovered Philip Glass back in 1983 with the release of Godfrey Reggio's stunning film Koyaanisqatsi. It was pretty much at that moment that his music properly crossed into the mainstream even though musicians like David Bowie had been singing his praises in the late 1970s. Glass emerged from the school of minimalism, a term he and the other musicians such as Steve Reich, Terry Riley and Michael Nyman would rather liked to have rejected. He distances himself from the term and describes himself as a composer of "music with repetitive structures." After the groundbreaking score for Reggio's film, Glass has continued to expand the nature of his work, not only covering theatre, opera, film scores but also working with Bowie, Eno, David Byrne, Leonard Cohen, Patti Smith, Paul Simon and Aphex Twin. 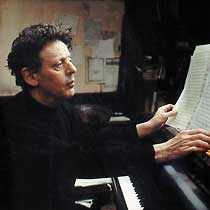 He's also worked diligently on a growing body of symphonies, concerti, music for dance and ballet and solo piano works. It's the solo piano music that Glass brought to the Futuresonic 2009 festival and conference this weekend with an 80 minute set at the Royal Northern College Of Music in Manchester. For some there is perhaps the perception that his solo piano pieces could be prejudged as the ultimate in minimal expression of his music. Judging by the wide range of pieces he performed this would be an erroneous view. Glass, an adorable, softly spoken 72 year old, whipping his glasses off at the beginning of each piece to briefly introduce the audience to the works in question, wrangles the keyboard with a mixture of attack and seduction. Despite looking tired and not quite remembering the dates of said pieces, he sat at the grand and like a snake charmer mesmerising a recalcitrant viper, he urged music of great complexity, subtly and melody out of the instrument. There was also an inner sound reverberating out of this music, a 'haze' (for want of a better word), that often possessed the accumulative structures and than sang out above them. A very curious effect to hear at first hand and something that might perhaps account for his wider appeal beyond the conservatoire. 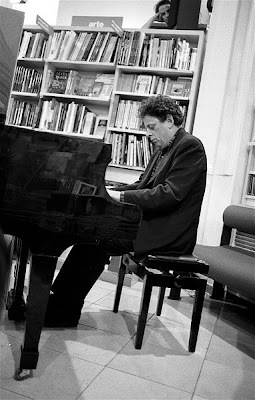 Beginning with a selection from the gorgeous Metamorphoses (from his Solo Piano album, composed for a version of Kafka's Metamorphosis and some of which you will have heard in the reimagined version of Battlestar Galactica), Glass held a filled to capacity venue enraptured. The repetitive structures are there and the pieces are, technically at least, highly representative of his methodology but these are far from the clinical sounding works that the titles suggest. Full of melodic and harmonic progressions, the music building and cycling with various motifs repeated and adapted as his hands sprang across the keys. A piece for dance, Mad Rush, rapidly followed and then the most powerful section of the concert, eight of the sixteen Etudes For Piano. Glass played these end to end and it was here that the familiar repetitive structures moved away from the pleasantly recognisable and into a highly complex relationship with blues and jazz that displayed more humanity and soul than many of his large scale works. Much of that humanity also came from the rough around the edges playing. Glass is an accomplished player but he isn't technically one of the best and the various slips are perhaps an aspect of the music that should be embraced rather than used as an excuse to reprimand him. Personally, I'd like to see other pianists attempt the Etudes at the age of 72 and still dazzle an audience with drama and passion as well as the scintillating carousel of melodic playfulness that was inherent in this performance. Glass humourously kept adding concluding piece to concluding piece, and offered us such wonderful nuggests as a passage from The Screens, music from The Thin Blue Line and 'Closing' from the superb Glassworks. A beautiful, thought provoking evening and bizarre in that it almost felt as if your long lost uncle had shown up to do his party piece only to leave you agog and wanting more. A well deserved standing ovation too after what can be best described as a rather moving out of (the) body musical experience. You're very welcome. Keep reading!